This is a great, simple meter. It's selenium and it doesn't need batteries; there's a diffusion-strip for incident readings that's built into the meter--all you have to do is slide the button on the side. It's small, it's very light, yet it's very easy to read and use. It's what the Weston direct-reading meters should have been like. This one, like it's nearly identical younger brother, the Pilot 2, still works after all these years. I got it the old-fashioned way: in a gadget bag full of miscellaneous junk that I bought at a thrift shop. 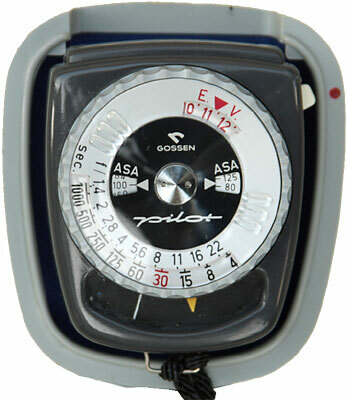 Like the Pilot 2, I left it in its gray plastic clamshell case (which screws onto the bottom of the meter).